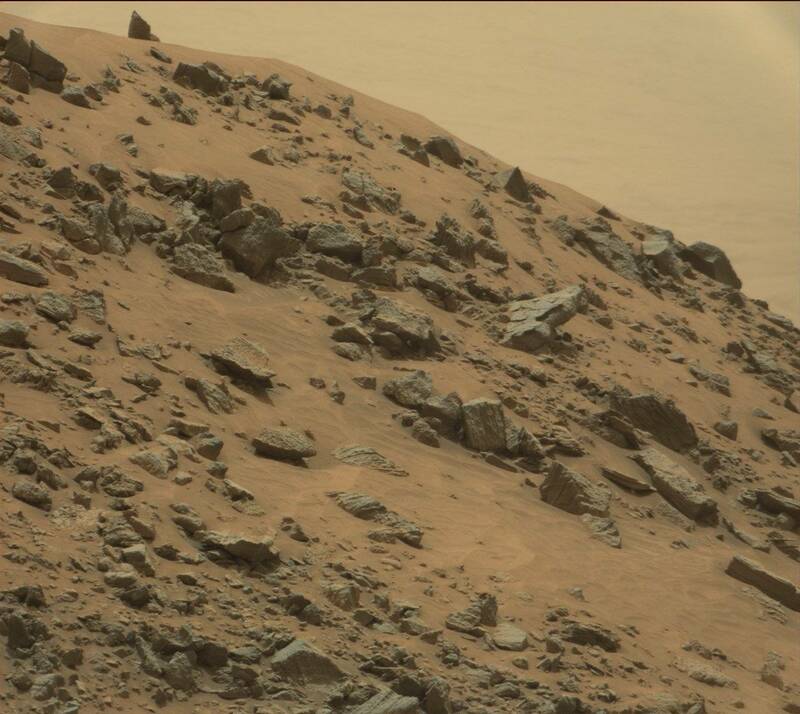 On May 7, NASA’s Curiosity Rover photographed what clearly appears to be a pyramid on Mars. The pyramid is estimated to be the size of a small car or the capstone of a much larger pyramid buried beneath the Martian sand. The straight-line geometry and symmetry of the pyramid points to it being artificially created rather than a mere geological formation. The pyramid is among the clearest photographic evidence collected so far that artificial structures exist on Mars built by an earlier civilization. The Curiosity Rover image follows upon other photographs of the Mars surface that clearly show artificially created objects. A Mars Global Surveyor image from March-August 2000 showed what appears to be a base or flying saucer shaped object perched on the edge of a cliff. The image can be found on the Malin Space Science Systems website which designed the camera used by NASA’s Mars Global Surveyor Orbiter. The Mars Global Surveyor object is symmetrical with what appear to be observation windows. The structure does not appear to be damaged at all, and shows no telltale signs of atmospheric wear and tear. The object has a smooth contour with polished edges. This suggests the structure is currently in use. Its position overlooking a canyon raises the strong possibility that it is an observation post belonging to or attached to a nearby base. It’s not just artificial structures that have been photographed on Mars by NASA rovers or orbiters. According to a whistleblower called “Jackie”, whose job in 1979 was to monitor NASA’s telemetry equipment with the Viking Mission, she and her colleagues saw on video monitors two men in environmental suits casually walk up to one of the two Viking Landers on Mars. Jackie and her colleagues couldn’t believe their eyes and quickly ran upstairs to the main NASA telemetry room to check if the main video feeds showed the same thing. They were locked out! NASA was covering up video evidence of men walking around on Mars from its own employees! What Jackie and her NASA colleagues saw that day was video evidence of a highly classified space program with astronauts, and one or more nearby bases on Mars. This suggests that what the Mars Global Surveyor Orbiter photographed in 2000 may well have been an observation post belonging to a secret Martian base. All this helps to confirm that life presently exists on Mars, and did so in the ancient past. Artificial structures such as pyramids were likely built all over Mars; and, like those found on Earth, could have been very large. The Curiosity Rover may have only photographed the tip of a pyramid most of which is buried beneath the Mars surface. What we know from the 2000 Global Survey photo, Jackie’s testimony and Curiosity Rover images, is that NASA photographs are only the proverbial tip of the pyramid when it comes to evidence of artificial structures and past civilizations on Mars. In an announcement, OPM said that investigators concluded this week with a high degree of confidence that the agencys systems containing information related to the background investigations of current, former and prospective federal employees, and others for whom a background check was conducted, were breached. The separate background-check database contains sensitive information  called SF-86 data  that includes applicants financial histories and investment records, childrens and relatives names, foreign trips taken and contacts with foreign nationals, past residences, and names of neighbors and close friends. In your report of the June 5 meeting you say that the Earth Based Alliance has accumulated a lot of personal data of individuals for future war crimes trials through hacking of Western Government Personnel Databases. Can you elaborate on who comprises the Earth Based Alliance, and whether the June 4 announcement that 4 million federal workers files were hacked in Dec 2014 is part of this Earth Alliance operation? Goode says that there have been a number of defectors from a secret space program called the Interplanetary Corporate Conglomerate (ICC) that has been directly linked to the galactic human slave trade and the use of slave labor at its secret bases on Mars and elsewhere in the solar system, These defectors have been revealing what they know about this abuse and will testify at upcoming war crimes trials. Its important to emphasize here that the files of senior personnel working in the ICC are likely part of the database of information gained through the hacking incident announcement on June 4. This was an unusual meeting because of the types of people that were present. There was a presentation of the information provided to the Alliance Council by the Defectors and what they would testify to. The Earth Based Alliance then presented a large amount of information that they had just obtained through hacking and espionage from western governments (U.S. and E.U.). Once this presentation was over and the Earth Based Alliance and the Defectors/Witnesses were escorted to their next part in their activities. According to Goode we wont have to wait long. He has revealed that the extent of disclosure is at this very moment being worked out behind the scenes by a wide array of secret space program alliances and extraterrestrial visitors. An offer was made for a limited disclosure to begin in November with only one high level official coming forward to take responsibility. The offer was declined, and plans proceed with a full disclosure event where all is revealed through information dumps and more whistleblower testimonies. If the June 4 hacking announcement is any guide, a future disclosure of secret space programs and extraterrestrial life will be quickly followed by Nuremberg-like trials for all government and corporate personnel linked to war crimes. It started as a day like many others for Jackie and her NASA colleagues whose job in 1979, was to monitor NASAs telemetry equipment with the Viking Mission. If anything went wrong with the equipment, her job was to get it back up and running as fast as possible. What she and her colleagues saw on video monitors down stairs from the main telemetry room shocked them profoundly. Two men in environmental suits casually walked up to one of the Viking Landers on Mars, and proceeded to do something to the Landers equipment. Jackie and her colleagues couldnt believe their eyes and quickly ran upstairs to the main NASA telemetry room to check if the main video feeds showed the same thing. They were locked out! NASA was covering up video evidence of men walking around on Mars. A far more advanced space program than NASAs, already had astronauts up there. What Jackie and her NASA colleagues saw that day was video evidence of a highly classified space program with astronauts and one or more bases on Mars! George: What was going on in 1979 on Mars? John: They were probably making repairs. Do you know what kind of suits they wore? John: Well they wouldnt have to wear very much. Theres enough atmosphere to walk around without a space suit on Mars. Same as there is on the Moon. Its like about 15,000 feet on Earth. Now you can go through a 24 hour acclimation program on the moon and you can walk around without a space suit. Same thing on Mars, you dont need a spacesuit. If they had one it was just minimal. George: Did you have any other witnesses there while you saw this? Youve seen the typical NASA things where theyve got all the monitors. The people that were up there, and then theres about half a dozen of us downstairs. It was just maintaining the equipment, because if anything went wrong we had to get it up quick so they didnt miss the telemetry. George: You folks must have been amazed at what you saw. Jackie: Yeh, because when we saw that and they cut off our video downstairs, of course we ran upstairs. Theyve got almost side doors upstairs with those little windows. Have you been there? George: I have not. No. Jackie: Ok, well theyve got those side doors going up to the back. What we call the nose-bleed section in most stadiums and stuff. But anyway, we go up there and we could look through the little window, because they had just locked the door. They normally dont lock it on us. But anyway they just locked the door and then we saw some more on their monitors, and then they came over, and taped some paper over the door. Jackies description of what she and her colleagues saw is very revealing about how NASA deals with evidence of a highly classified space program and how this is kept from its employees and contractors. First, theres a secret space program that has humans on Mars. The Martian astronauts can walk around in some kind of minimal environmental suit, rather than the more bulky space suits worn by astronauts. This suggests that there is a thin Martian atmosphere and walking around in it requires similar equipment to walking around at high altitudes, as John Lear described. Second, the Mars based astronauts perform various functions on NASA equipment to maintain or extend the service life of Mars landers and rovers. This helps explain the very long and surprising service life of Mars rovers such as Spirit and Opportunity that ‘fortuitously have had surface dust removed from their solar panels by the Mars wind, thereby extending their service life for years. Third, there was no malfunction with the video telemetry equipment because when Jackie and her co-workers ran upstairs to the main telemetry room they could see through a small window on the door that the main video monitors were showing the same thing. Fourth, the secret space programs existence is highly classified. Jackie and her co-workers clearly did not have the security classification to know about the Mars program, and so they were locked out of the main telemetry room. As Jackie said, normally the door was unlocked, so the incident involved classified information and only those with the necessary clearance were allowed access. Fifth, Jackie was seeking information about the incident from John Lear, suggesting that she and her other colleagues were told to simply forget about the incident, and concentrate on their job assignments. For NASA employees the risk of losing their jobs and security clearances for violating security, was powerful incentive to stay quiet for years. For Jackie, it took 27 years to publicly come forward. Finally, there was at least one person or more in the main telemetry room that had sufficient clearance and need to know whose responsibility was to ensure that personnel without clearance would be locked out. It was this individual(s) that arranged for the main telemetry room to be locked, and the small window to be papered over. The important question that now arises is whether or not Jackie is genuine. She certainly appears sincere in the audio recording, and doesnt appear to be grandstanding or making it up. She appears to be genuinely seeking information about an incident that happened 27 years earlier in 1979, when she worked as an employee with NASA, and has left her puzzled ever since. Importantly, Jackies information is consistent with what a number of whistleblowers have said (see here and here) about a classified space program with bases on Mars, and a thin breathable atmosphere requiring only minimal protection from the elements. Jackies revelation is startling first hand testimony that a highly classified secret space program exists that as early as 1979, had astronauts on the Martian surface interacting with NASA equipment. NASA is not only covering up the existence of highly classified program with Martian astronauts from the general public, but also covering up the programs existence from its own employees.